Massive crowd at the Pashtun Tahafuz Movement public gathering in Lahore. Photo from Facebook. Used with permission. 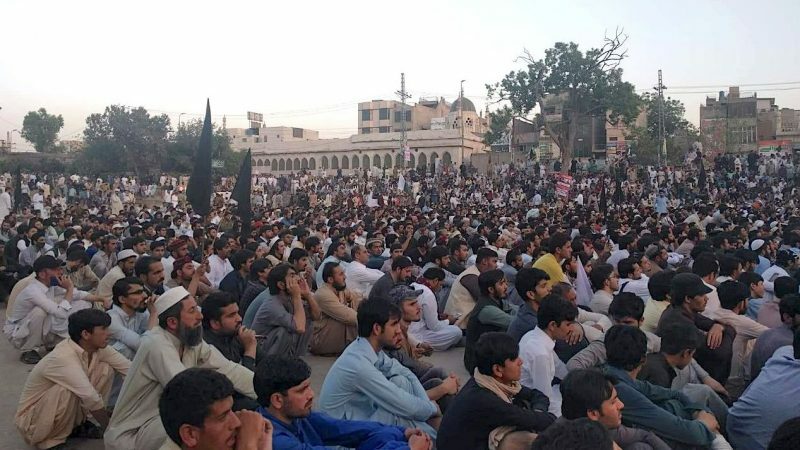 In the past months, the Pashtun Tahafuz (Protection) Movement has been mobilizing in Pakistan’s major cities to demand basic rights for the Pashtun minority community, including the “right to live without fear” of extrajudicial killings. The Pashtuns (or Pathans) are an ethnic minority group who mostly live in Pakistan and Afghanistan. Discrimination and violence are constant threats for Pashtuns, half a million of whom have been internally displaced due to conflict between the army and the Taliban militant group. In 2016, Pashtuns were given official clearance to return to their home in Pakistan’s Federally Administered Tribal Areas, but landmines planted there mean many can’t can’t safely return. 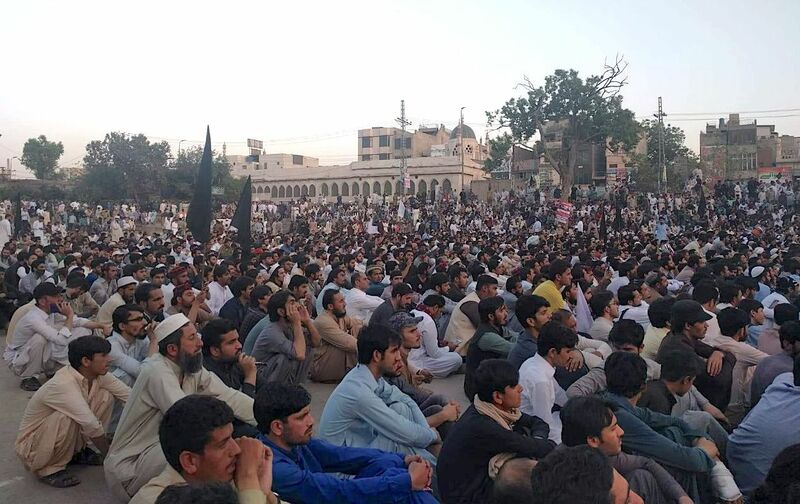 The Pashtun Tahafuz (Protection) Movement, known as PTM for short, has become a rallying point for thousands to speak up about these injustices. But their challenges are many. Members have faced legal harassment, with repeated arrests. Local human rights defenders say the Pakistani mainstream media, especially TV channels, are ignoring the movement altogether. And in one case, a digital outlet that covered the movement from a critical angle experienced disruptions to their website, in what some editors feared was a targeted technical attack. Social media has been the only local platform where Pakistanis can reliably find robust and continuous coverage of the moment. So when Twitter suspended the account of one of the movement’s most prominent leaders on April 26, many feared it was silencing the voice of an activist demanding equal protections for human rights. Pashteen’s account was later restored, and Twitter has yet to comment on why it happened. Self-censorship is not uncommon in Pakistan’s journalism sector. Neither is overt censorship. In November 2017 amid anti-blasphemy protests, the Pakistan Electronic Media Regulatory Authority blacked out all private news channels for 26 hours. Most recently, Geo TV, one of Pakistan’s leading television news channels, was blocked for a few weeks in April 2018, allegedly for its critical coverage of the military. [The censorship is prompted by] insecurity of the military establishment determined to get a positive outcome of [their liking] in the next polls. [This is why] banning Geo TV is also a message to all and sundry to fall in line and sign the dotted line. Beginning with a crackdown against select media groups and banning the broadcast of various channels, there now is enhanced pressure on all media houses to refrain from covering certain rights-based movements. Media house managements under pressure are dropping regular op-ed columns and removing online editions of published articles. One media house even asked its anchors to stop live shows. When it comes to the PTM, daily newspaper The Nation reportedly refused a piece of commentary about PTM by columnist Gul Bukhari for being critical of state institutions. Another online publication called Naya Daur later published the article, but its website soon suffered problems, which the outlet feared had been censored by authorities. Three or more articles were taken down from online portal The News which were about the movement and many other websites refused to publish articles related to the March. 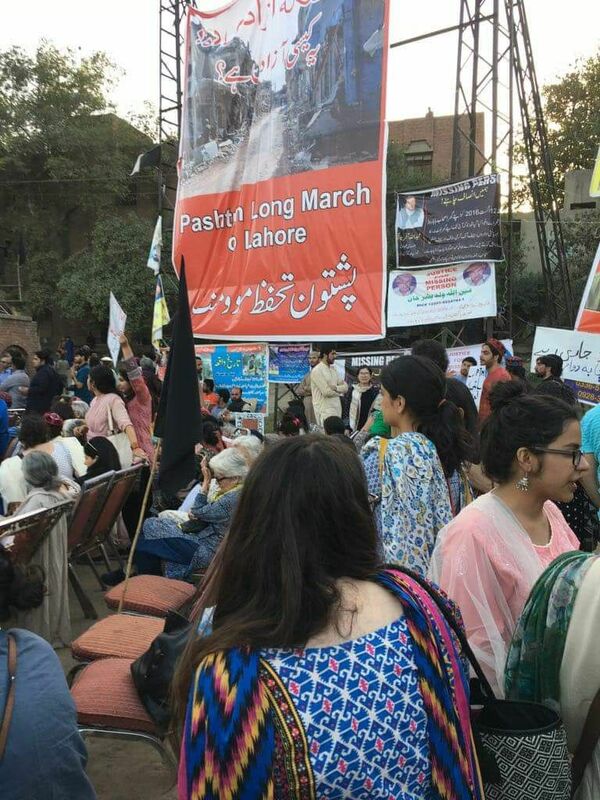 Pashtun Tahafuz Movement public gathering in Lahore on April 22, 2018. Photo from Facebook. Used with permission. Pashtuns in the FATA area are still heavily policed in their day-to-day lives. Residents must pass through military checkpoints in order to travel through the region. Protests were held in Swat weeks ago, demanding the removal of military checkpoints after a child died waiting for clearance at a checkpoint. But police also are taking action against protesters for causing a nuisance. This type of response by the administration is creating controversy over the legitimate demands of the protesters, with authorities suggesting that they are somehow “anti-state”. Yes, we do want “Azadi” (independence), the Azadi that is enjoyed by the rest of Pakistan. Their efforts are not in vain, some of their demands seem to have met. Authorities have agreed to protesters’ demands to end the Watan Card (an identity card) which originally launched in 2010 to provide financial assistance to the flood-affected population. This became a de-facto passport for people from FATA to travel within the country and is now increasingly being used to discriminate between (and against) specific ethnic groups. In mid-February 2018, the card was done away with. In other gains, many missing persons have returned home, and there are reports of bomb disposal teams working on the removal of landmines in Waziristan. However, PTM believes there is a long way to go and they would continue the struggle until sufficient and satisfactory action is taken. An Apex committee including the army officials and the provincial government of Khyber Pakhtunkhwa has agreed to hold negotiations with PTM. Meanwhile, the movement continues with peaceful demonstrations across the country. The movement has inspired others as well to speak up about the violation of their rights and is being joined by other ethnic minority groups in the country. Previous PostThis Photographer Is Capturing Sindh In The Most Beautiful Way!